If I have one regret from Glastonbury Festival it is that I missed the Dalai Lama's 80th birthday speech - but even that's not much of a regret. One thing I learnt over the five days was to slow down and move at festival pace, even if that sometimes meant I didn't get where I was intending to go. Rushing around with just a goal in mind can mean missing out on fun along the way. It is okay to be where you are, even if that isn't where you wanted to be. Glasto is massive. It can easily take 40 minutes to walk from one side to the other - longer if there are crowds of people all trying to get from one stage to the other at the same time between bands. Added to that, the ground gets really muddy after even a little rain and if you need to stop to use a loo or fill up a water bottle you will probably have to queue for five or ten minutes as well. If you let yourself get stressed out by that, you won't get the most out of the festival. You have to live in the moment, which is a good lesson to learn. One of my best Glastonbury experiences was one of those kinds of moments. I was in a very long queue at some rather smelly toilets (if you have even been to an outdoor music festival you can probably picture that). People were filling up the ground in front of the stage. I was worrying that I'd not only miss the start of the band I wanted to see, but that I'd be quite unable to find my mates in the crowd. Then I got talking with four other women in the queue. We were different ages and I suspect from very different backgrounds outside the festival, but that didn't matter. We shared tips for keeping clothes away from the mud (and other muck) in loos. The youngest, maybe 16 years old, offered to share her pack of wet wipes with us. A DJ started playing an Oasis song nearby and we all started dancing and singing along to it. By the time we reached the end of the queue and it was our turn to face the terrible toilets, we had bonded so much that we hugged each other and said our farewells as though leaving old friends. 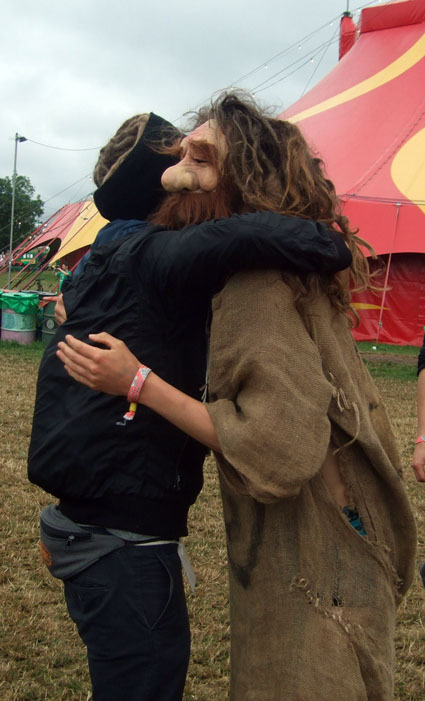 That's another Glasto lesson - that wherever you are you will find music and mates if you look for them. The Dalai Lama gave a birthday message to the crowd during Patti Smith's set at the Pyramid Stage. I had also wanted to be there for that, but I was right at the other side of the festival. Earlier in the day I had gone in search of a cup of chai, which is a lovely spiced tea and the perfect pick-me-up festival drink in my opinion. I'd wandered up to the healing fields and found the Mandala tent where chai was on offer, folk music was being sung and there were some nice benches to sit on and rest weary legs. 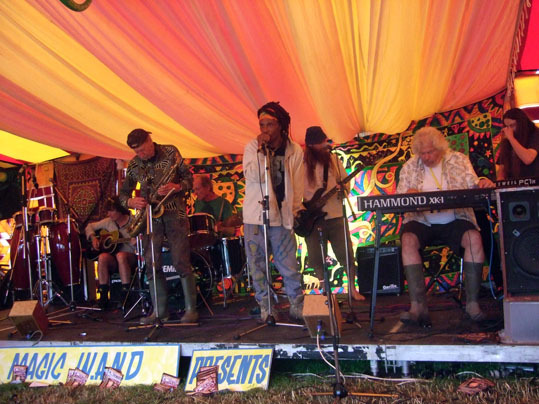 When the folk music ended, Nik Turner (formerly of Hawkwind) came onto the stage for a jamming session with various other Glasto old-timers, including someone called Captain Whizz who I had never heard of before. But the set was so good I got up to dance despite aching feet. Then I realised I was missing Patti Smith and the Dalai Lama, but I didn't mind. I was where I was and that was a good place to be. It is, undoubtedly, a good message. I hope I'm not being too irreverent when I say what it reminded me of - the message from the time travel movie Bill and Ted's Excellent Adventure: "Be excellent to each other...and...PARTY ON DUDES!" 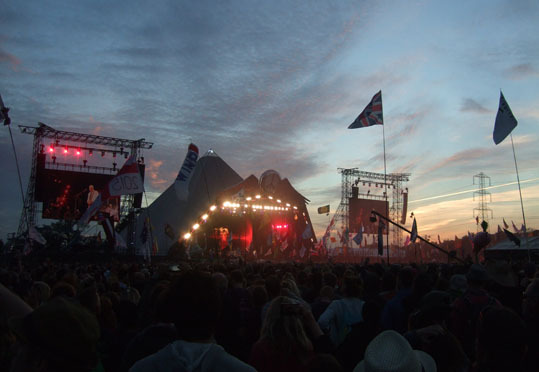 I think if I could time travel, I would go back and experience all the Glastonbury Festivals of the past. There are so many wonderful lessons to be learnt in festival time - and so many wonderful friends to make there.